Start by making certain your compressor is completely disconnected from the power source. The motor on the compressor is shipped wired for 110 volt use. 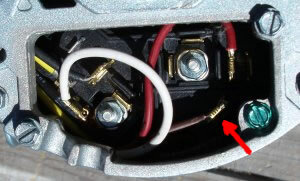 To change the wiring to 220 volt single phase use, two wires need to be moved. Important: When your wiring changes are complete, you will need to install a new 220 volt power cord. Do not attempt to use the existing 110 volt power cord. 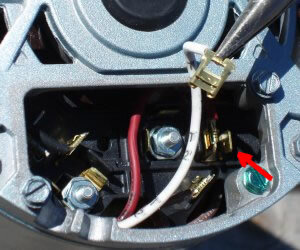 Step #1 – Remove the cover plate by loosening the two hex head screws. No need to remove the screws just loosen them. Then remove cover plate. 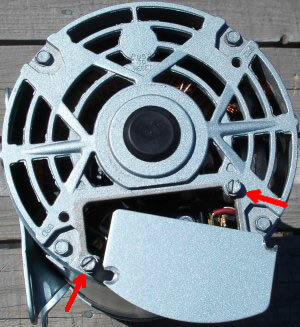 Step #3 – Place the brown wire connector on the lower right lug blade as shown. 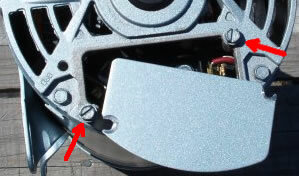 Step #5 – Place the white wire connector on the far right lug blade read arrow is pointing to. 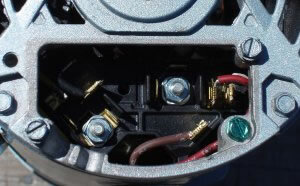 Step #7 – Make sure all wires are neatly tucked back in the compartment. Now, replace the cover plate under the two hex head screws. Tighten both of the screws hand tight. 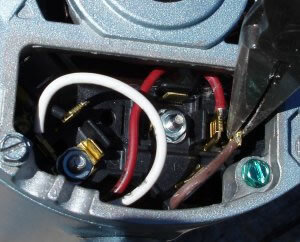 Step #2 – The motor on the compressor is shipped wired for 110 volt use. To change the wiring to 220 volt single phase use, two wires need to be moved. 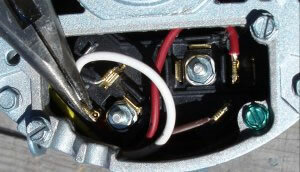 The brown wire on the right of the opening and the white wire on the lower left main lug. Using a needle nose type pliers pull the brown wire connector from the right lug blade. Step #4 – Using the needle nose type pliers, remove the white wire connector from the lower left connector lug. Step #6 – You’re all done with moving wires. Both the white wire and brown wire should now be at the proper locations. This completes the motor wiring change to 220 volt single phase. Remember: The power cord needs to be changed to a 220 volt power cord and plug. Visit our How to rebuild a rotary compressor page.